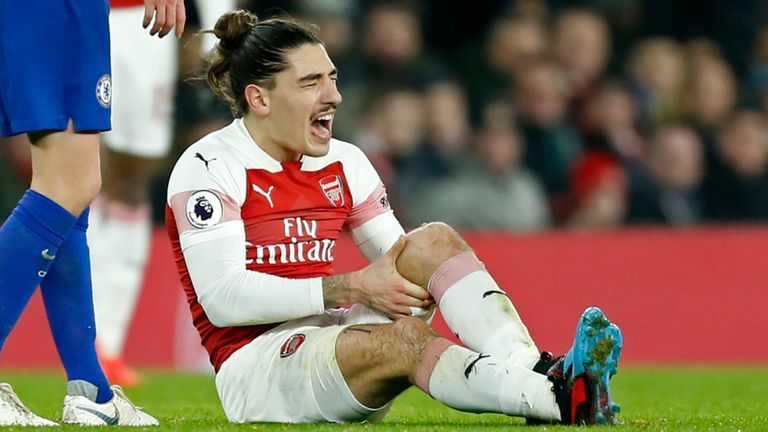 Arsenal FC have officially announced that Hector Bellerin will be out of action for the rest of the season subsequent to rupturing anterior cruciate ligament in Gunner‘s win against Chelsea on Saturday. The Spain defender sustained the injury during the 70th minute of the London Derby when he went down unchallenged and was carried off on a stretcher. The 23-year-old was making his first league start since mid-December, having conquered a calf injury, and now joins Danny Welbeck and Rob Holding in being ruled out for the remainder of the campaign, and perhaps the start of the 2019/20 season. Arsenal revealed the severity of his injury on Tuesday morning with a statement on their website. ‘Further to the injury sustained during our match against Chelsea on Saturday, we can confirm that Hector has ruptured the anterior cruciate ligament of his left knee,’ it read. ‘Hector will undergo surgery to repair this in the coming days. The rehabilitation process is expected to take between six to nine months and therefore rules Hector out of action for the remainder of this season. The 23-year-old took to social media on Tuesday to post three pictures of his heavily-braced left knee and the ‘Game Ready’ system he is using to aid his recovery admitting he had experienced a ‘difficult couple of days‘ while thanking fans for their numerous support. ‘There are no obstacles in life you can’t get over,’ Bellerin wrote. The former Barcelona academy will undergo surgery soon, but he is now utilizing the cutting edge tech ‘Game Ready’ procedure to decrease swelling in his left knee. The procedure is a state-of-the-art take on RICE (Rest, Ice, Compression, Elevation) and includes wraps being set around the wounded part of the body. The temperature and pressure level would then be able to be effectively balanced using a compact control unit.